A complimentary review copy was provided to me. It has been a while since I have read a piece of Edwardian fiction, but these past couple of weeks I have been deeply engrossed in A Name Unknown by Roseanna M. White. 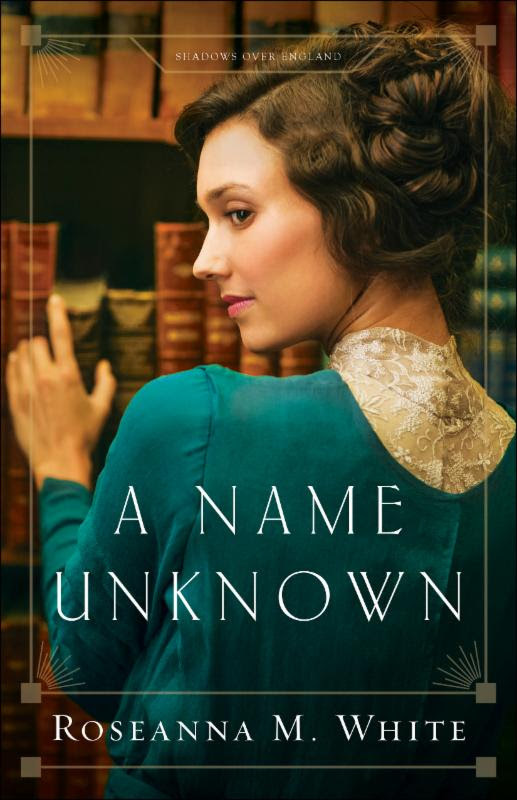 A Name Unknown is the first book in the Shadows Over England series and is set primarily in Cornwall in 1914. The author did a good job developing characters through the progression of the story, continuing to reveal things about some of the characters right up to the end of the story. Rosemary and Peter are an unconventional pair, she is poor, opinionated, streetwise and independent, and full of doubt when it comes to faith, he is rich, inclined to not speak his thoughts, has friends that look to him for advise and is strong in his faith. As the story unfolds, the reader starts to recognize the growing relationship between them and may even know they are falling in love before they do. Through her vivid descriptions of the settings, both internal and external, the author is able to transport the reader to another time and place. Her story was so engaging and that I found myself not wanting to put the book down, resulting in me yet again staying up later than I should simply so I can read a little more. The book had the perfect balance of an unlikely friendship, romance, mystery, deception, intrigue and faith. I look forward to reading the next book in this series. She's out to steal his name. Will he steal her heart instead? Rosemary Gresham has no family beyond the band of former urchins that helped her survive as a girl in the mean streets of London. Grown now, they are no longer pickpockets-now they focus on high value items and have learned how to blend into upper-class society. Rosemary's challenge of a lifetime comes when she's assigned to determine whether a certain wealthy gentleman is loyal to Britain or to Germany. How does one steal a family's history, their very name? Rumors swirl around Peter Holstein. Awkward and solitary, but with access to the king, many fear his influence. But Peter can't help his German last name and wants to prove his loyalty to the crown-so he can go back to anonymously writing a series of popular adventure novels. When Rosemary arrives on his doorstop pretending to be a well- credentialed historian, Peter believes she's the right person to help him dig through his family's past. Anger and danger continue to mount, though, and both realize they're in a race against time to discover the truth-about Peter's past and about the undeniable attraction kindling between them. Roseanna M. White pens her novels beneath her Betsy Ross flag, with her Jane Austen action figure watching over her. When not writing fiction, she's homeschooling her two children, editing and designing, and pretending her house will clean itself. Roseanna is the author of over a dozen historical novels and novellas, ranging from biblical fiction to American-set romances to her British series. Spies and war and mayhem always seem to make their way into her novels . . . to offset her real life, which is blessedly boring. She passes said boring life with her husband and kids in the beautiful mountains of eastern West Virginia. Find out more about Roseanna M. at http://www.roseannamwhite.com. You can read more reviews and learn more about the book on the Blog Tour Landing Page. No compensation was received for this review. All opinions expressed are my own or that of my family. A complimentary review copy was provided to me.